Associate Professor Mariela Olivares teaches courses in Immigration Law, Family Law, Domestic Violence Law and Advocacy, and Torts. In 2014, she became the director of Howard’s Family Law Certificate Program (FLCP) and is working with students and community members to expand the great work and reputation of the FLCP. Professor Olivares has been with Howard University School of Law since 2011. She has published extensively on immigration and its impact on immigrant families. Her most recent law review article, “Intersectionality at the Intersection of Profiteering and Immigration Detention” is available on SSRN . Mariela Olivares is an Associate Professor of Law at Howard University School of Law. She teaches Torts, Immigration Law, Family Law, and a seminar on Domestic Violence Law. Professor Olivares has taught at the Catholic University of America Columbus School of Law and was a fellow at Georgetown University Law Center. Her professional and scholarly interests include the intersection of family law, domestic violence and immigration law and policy, including access to justice for immigrants and limited-English proficient populations. 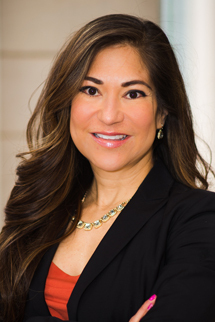 Prior to teaching, Professor Olivares was an attorney in the areas of family law and domestic violence law and has experience litigating employment discrimination and director and officer insurance liability cases. Professor Olivares clerked on the Supreme Court of Texas. She received her LLM in Advocacy with Distinction from Georgetown and graduated from the University of Michigan Law School where she was a Clarence Darrow Scholar and the Executive Editor of the Michigan Law Review. Professor Olivares graduated Phi Beta Kappa from the University of Texas-Austin with highest honors and special honors with degrees in Plan II Honors and Spanish Literature. Professor Olivares is a member of the D.C. Bar and Texas Bar.